Provide general advice, support and information. Deliver clinic-based individual and group therapy. We are a team of Speech and Language Therapists who provide a child centred and family oriented approach. Working closely with our partner services in Health, Education and Social Care, we contribute our expert knowledge of communication, speech, language, and feeding and swallowing to the team of professionals working with the child and their family. We focus on meaningful targets, jointly agreed with families, which promote the child’s wellbeing and independence as well as supporting their learning. I CAN is a UK charity for children with communication difficulties. It provides a combination of specialist therapy and education for children with the most severe and complex disabilities, information for parents and training and advice for teachers and other professionals. They also work to ensure that the needs of these children are taken into account in all children's policy and carry out research to find the best ways to support these children. Afasic is a UK charity, established to help children and young people, their families and the professionals working with them. Afasic is also a recognised training provider that offers a range of services that include a helpline, publications, support groups, and membership. The centre provides specialist support and expertise in the field of Augmentative and Alternative Communication (AAC) and Assistive Technology (AT). The team can provide a range of core specialist services including assessments, equipment loans, training and information. Afasic Scotland/Secondary provide some useful information on working with children with specific language difficulties in secondary school. For specific advice around differentiated speech, language and communication targets for both early years and primary. Advanced training materials for speech, language and communication needs (SLCN). The BSA is your first point of contact for information and support on stammering. Specific advice on the educational problems of a child with a stammer is available from the British Stammering Association Officer. 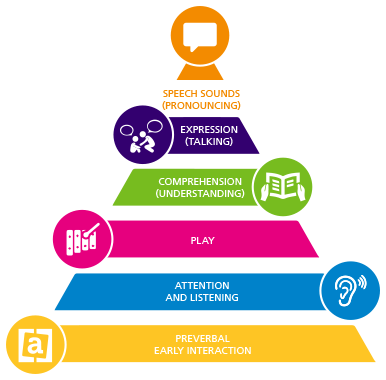 The BSA also provides a Teachers’ Video Pack and CD Rom, and a variety of practical guides for professionals working with primary and secondary aged pupils with a stammer. The Early Years team work with children aged between 0-5. We work closely with parents and other professionals involved in your child’s care to develop and support your child’s communication skills. The pyramid outlines the way that a child’s skills develop. Skills at the bottom of the pyramid have to be in place before they will develop skills at the top. Click on the area of the pyramid for our information sheets about what to do if your child has difficulties in that area. If you have tried these activities and are still concerned, please see our Making a Referral (Click Here) section, to refer a child for an assessment with a Speech and Language Therapist. Parents and school staff have a vital role to play in supporting children who stammer. Please see below some useful resources. The following link www.stammeringcentre.org/guides allows you to access a free ten minute online video by the Stammering Information Programme, entitled ‘Wait, Wait. I’m No Finished Yet’. On the same page you can also view and download free PDFs called ‘Top Tips’ and ‘Suggestion Sheets’. These are excellent resources to support any member of staff who works with a child who stammers in school.